Hingham Chiropractor | Dr. John Daoust | 328 East Street, Hingham | 781-740-1130 | When you're hurt … Call Daoust! 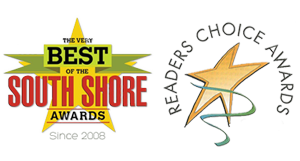 Dr. John Daoust has been practicing Chiropractic care for over 26 years and has won the “Best of South Shore and Reader’s Choice Award” for the last 9 years. Dr. Daoust has been the President of the “South Shore Chiropractic Society” and author of many newspaper articles. He frequently appears on many radio and TV talk shows to lecture on current Health Care alternatives. Dr. Daoust loves to fly and holds a private pilots license. He enjoys spending his free time with his wife Karen and 6 year old daughter, Grace.